B&W 800 Diamond review | What Hi-Fi? 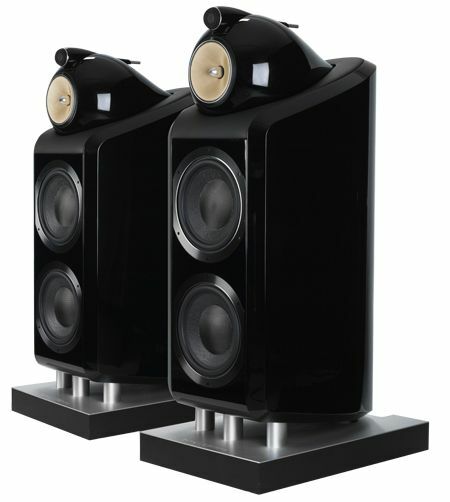 The 800 Diamond is currently the best speaker Bowers & Wilkins makes. A bold statement, indeed. But here’s why: the 800 represents not just the ultimate expression of all the company’s trademark technologies, but also ties the lot together in a performance that’s as complete as we have ever heard. Innovative technology and great sound don’t always go hand in hand. In the 800s’ case they do. Let’s start with the drive units. It’s the diamond tweeter that rightly grabs the headlines here. Not only does the use of such bling make for great ad copy, it also makes good engineering sense. Diamond’s innate rigidity helps to push any break-up modes to far beyond normal hearing levels. It also self-damps well, which makes for a better all-round performance. At best, human hearing extends to about 20kHz. B&W’s aluminium dome tweeters reach all the way up to 30kHz before their first break-up mode occurs. This diamond tweeter goes to 70kHz. However, there’s more to this tweeter than just the extravagant dome material. The drive unit sits in a decoupled external pod, as does the midrange driver. Why? Decoupling the unit means that any vibration caused by those massive bass drivers has less chance of distorting the higher frequencies. The tweeter is mounted at the mouth of a tapered tube, the sleek Nautilus. The tube also has internal damping; the idea is that any rearward output from the drive unit travels down this tube and is absorbed, so none of it reflects back (through the driver) to corrupt the forward output. The result is a cleaner, more detailed treble performance. Take a closer look at the midrange set-up and you’ll find more clever stuff. The drive unit uses a Kevlar cone, as is B&W’s way. The company likes the woven fabric’s behaviour when stressed and has spent years developing it. In this case, using the Kevlar cone in a dedicated midrange unit allows B&W to replace the standard rubber surround with a high-density foam that damps the cone more effectively. The low level of movement required for midrange frequencies helps make this possible. The result is lower distortion levels and better cone behaviour than more traditional designs. As with the tweeter, the midrange driver is housed in a decoupled unit that’s designed to reduce the distortion from rearward radiation. Its curved external shape avoids the unwanted acoustic effects caused by flat baffles and sharp cabinet edges. Twin cones made of Rohacell — a light and rigid carbon-fibre/foam composite — work in parallel to deliver the low frequencies. They are housed in a beautifully built curved enclosure, which is heavily braced to reduce resonance. And we do mean heavily – each speaker weighs 102kg. They come fitted with castors, but you’ll still need four people (or a couple of Geoff Capeses) to get them into place. All four driver units are combined in a three-way configuration with a high-quality but relatively simple crossover design (shown below). Not only does this simplicity promise much better sound, but the reduced component count means there’s more budget to spend on the remaining parts. And the components used in the 800s’ crossover are distinctly top class. In a small space, the 800s’ beautifully taut bass stays controlled – go bigger and you’ll have a depth and definition that’s hard to better. And it’s all delivered with breathtaking speed and punch – provided your system is up to scratch, that is. These B&Ws crave power, lots of it: they’re nominally rated at 8 ohms impedance but can dip down to 3 ohms at certain frequencies. So an amp with very good current delivery is a must. It sounds enjoyable enough with the Pathos Ethos integrated amp, but pair it with Bryston’s effortlessly capable 300W 4B SST and things get a lot better, with the low frequencies gaining grip and authority. Step things up with the Inception OST, and the 800s will deliver the huge dynamic sweeps befitting composer Hans Zimmer’s staggering score. But it doesn’t stop there. Connecting the on-test £23,000 Krell Phantom II/ 402e pre/power combo (400W per side) shows there’s more to come in terms of volume, dynamic reach and bass grip. While this is all impressive, it’s also expected of a near-20-grand floorstander from one of high-end’s major players. Not anticipated, however, are the speakers’ agility and rhythmic drive when asked to replay, say, Major Lazer’s Pon de Floor. This banging tune is hammered out with an immense enthusiasm and terrifically precise timing. In short, we’re just not used to such authoritative speakers sounding so incredibly responsive. Offer up Kate Bush’s more delicate vocals on 50 Words For Snow, and the 800s show their sensitive side. Bush’s vocals are intimately portrayed, and rendered with all the finesse required, while the album’s subtle dynamic shifts are handled with the utmost care. And even more impressive is the B&Ws’ ability to disappear within the soundstage better than any we’ve heard. Yes, £18,500 is a lot. Yet compare the 800’s performance with that of its rivals and you might even think that B&W has underpriced them. We started by saying that these are the company’s best speakers. But we’d go further than that. For us, there isn’t another with such clarity, dynamic reach and volume levels anywhere.